For giggles, I posted a photo of four ugly pies on Facebook. It sent my followers into a twitter of dismay and disgust. “These ugly pies keep coming up in my feed,” one friend wrote. “Please, please make them go away.” The baker had sliced the crusts into grotesque faces — eyes half-closed with cherry filling seeping out, twisted mouths drooling blueberry, nostrils crusted with peach juice. Not funny, my friends said. Not funny at all. Post what you want on FB, but do not mess with pie. Pie is a sacred cow. When my book “Live Free and Eat Pie” came out, some thought it was a cookbook. It’s not. 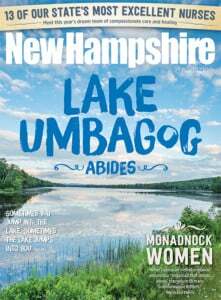 It’s a guide to New Hampshire geography, history and tourist spots. However, when the book scored me an invite to judge a pie contest, I accepted with relish. Trouble was, I liked them all — the blueberry, the pumpkin, the peach (oh my lawd, the peach!). The mincemeat, not so much. The only meat pie I enjoy is Memere’s tourtiere. After sampling a high pie with fluted edges, the real judges exchanged looks of horror. I did. They stared expectantly. I caved and made a sour face. In my world, if it ain’t black, it ain’t burned, but I deferred to their sensitive palates. Then, the final horror. The real judges gasped at the very sight of pie #10. “I think it is,” the other said. “What?” I said. A real judge whispered, “Store-bought crust.” We shuddered as one. Confession: I sometimes use store-bought crust. I know it’s wrong, but making crust from scratch is time-consuming and messy. Also, the perfectly rolled, lard-based crust that lifts from the board in one smooth sheet eludes me. My crusts are Frankenstein monsters — lumpy and pieced together. Patchwork. My pies are ugly. But the family gobbles them up just the same. If you don’t know the legend of the Moosetud Pie, here it is. In the logging camp, absent a professional cookee, one logger had to do all the cooking. Feeding those lumberjacks was a colossal job and Sis got stuck with it. By tradition, the first man to complain about the grub had to take over. After about six weeks of thankless toil over a hot woodstove, Sis decided he’d had enough. He burned the pancakes. Nobody complained. He hot-peppered the beans. Delicious, the loggers declared. He boiled the venison. Nobody said a word. A minister got caught in a similar pie dilemma. Lucy, a member of his congregation, presented him with a homemade apple pie. That evening at supper, when the family tucked in, it was clear that Lucy had mistaken salt for sugar. The pie went swiftly to the compost pile. Humorist Rebecca Rule has written lots of books about pies and other inherently amusing stuff.